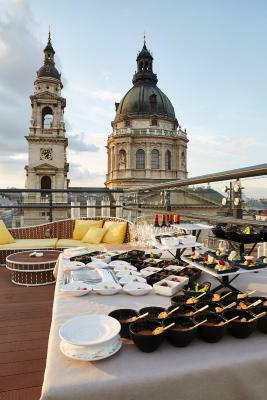 Lock in a great price for Aria Hotel Budapest by Library Hotel Collection – rated 9.6 by recent guests! Our family loved the 4nights spent in Aria Budapest . Their service is superb!!! 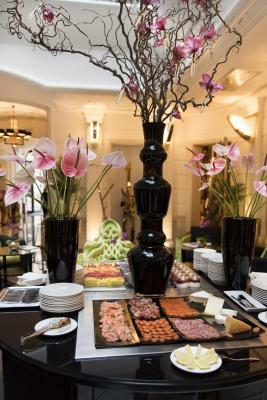 The friendliness of their staff and most especially the hospitality of the manager make you feel extra special. 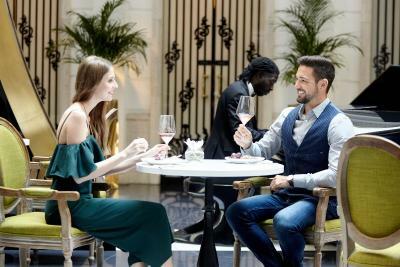 Love the features of this hotel from the deep music selection you can play in your room , live music in the afternoon with cheese and wine, the High Bar and the Spa .. Their location is ideal, very near St Stephen Basilica withs lots of nearby good restaurants . We will definitely come back in this hotel. 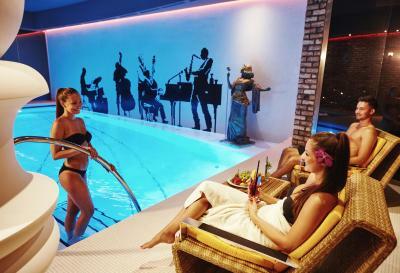 Awesome room, great location, great pool, spa, and rooftop bar. The property was beautiful with modern amenities that did not ruin the building. The staff was incredibly helpful. The breakfast and rooftop bar were exceptional. It was also a wonderful location. All in all, very happy. 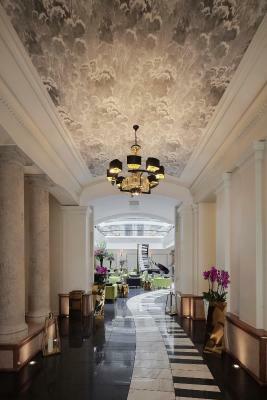 Loves everything about the hotel..excellent services,location and interiors. Staff from the minute we arrived on the door (Adam) to the spa manager christina and the holiday concierge Szilvia. Made the journey and stay very pleasant, every member of staff always greeted you and couldn’t help us more. I would definitely be coming back. 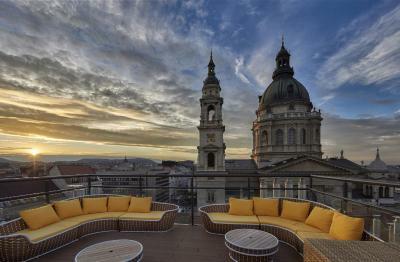 We chose this hotel as one of the most interesting one on the Pest side. The first impression - very kind and professional staff, brilliant service. Room was very clean and stilish. Bed was big and comfortable. Clean and nice bath. 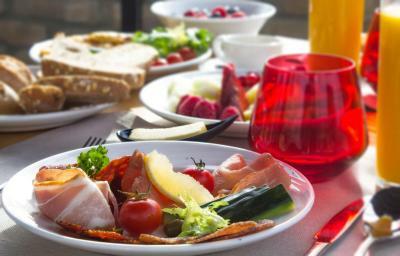 Breakfast was really nice, you can choose what to eat from a menu with specified positions (eggs in different variations, pancakes etc.) and enjoy it in a beautiful and nice hall. 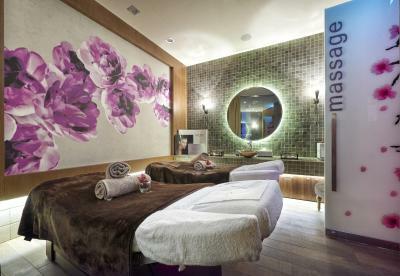 Spa area was very good, not too much place, but enough to relax and feel comfortable. A lot of towels available😁 Sky bar - very nice place, but need to book the tables preliminary, if you want to sit outside, especially when the weather is comfortable. Small snacks at the bar - especially which are on stone, like mini steaks - very tasty! Great place to stay at’ the staff were amazing and the location is the best in town! Everything was top 12 mins walk from the hotel! 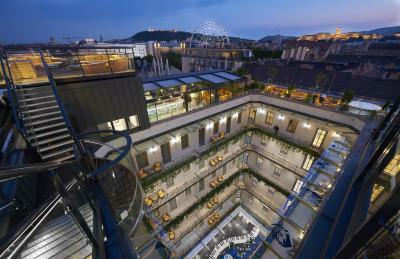 This is the place to stay in Budapest! I really enjoyed the techs and gadgets in the room. The sound bar under the TV was great. We had some trouble with the all-in-one switches, but ultimately it was fun too. The TV sound was broadcasted to the bathroom, we really liked that. Also the modern stylish interiors was wonderful. The staff was exceptionally friendly and nice. Excellent location, we walked out the door into St. Stephen’s Christmas Market. We could easily walk around the city. The staff was friendly and the hotel modern and beautiful. 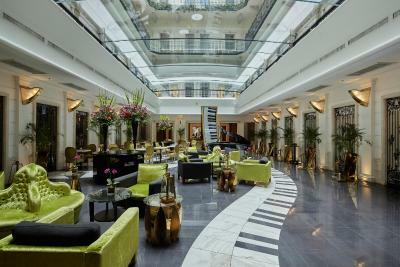 After visiting this hotel I can understand why it is rated as #1 hotel in budapest. 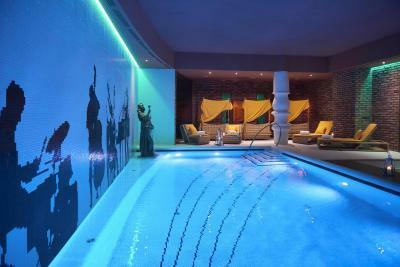 A truly unique romantic hotel with professional staff, great location, beautiful rooms, relaxing spa and pool area. Now what we like the most was the wine hour with amazing live music. 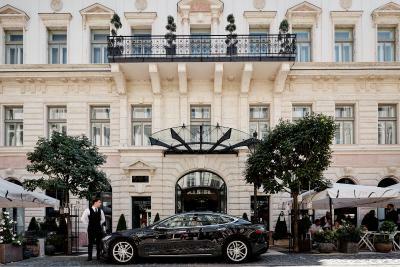 Aria Hotel Budapest by Library Hotel Collection This rating is a reflection of how the property compares to the industry standard when it comes to price, facilities and services available. It's based on a self-evaluation by the property. Use this rating to help choose your stay! One of our top picks in Budapest.Offering a rooftop bar with panoramic views of downtown Budapest, the nonsmoking Aria Hotel Budapest by Library Hotel Collection features rooms and suites designed around 4 music styles and a spa center with a pool, saunas and a hammam. Free WiFi is available throughout the hotel. 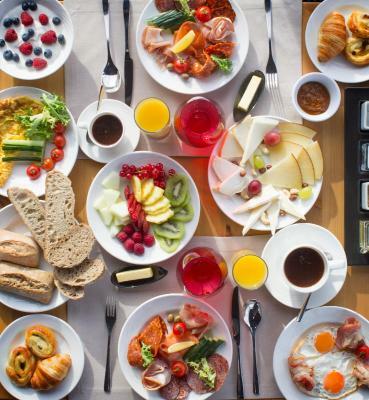 A rich complimentary buffet breakfast is served each morning in the Aria Hotel. Gratis coffee and tea are served with cookies and fruits during the day and a free wine and cheese reception is available every afternoon from 16:00 to 18:00. 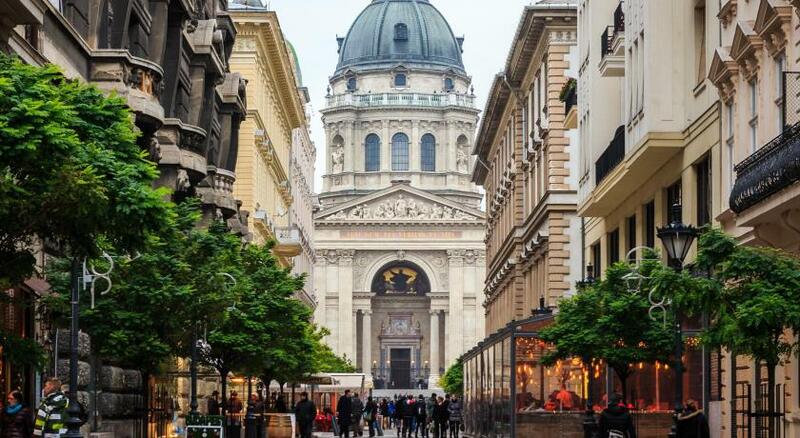 The St. Stephen's Basilica is 350 feet from the Aria Hotel Budapest, while the State Opera House is a 5-minute walk away. Budapest Liszt Ferenc Airport is 11 mi from the property. Airport shuttle is available on request. 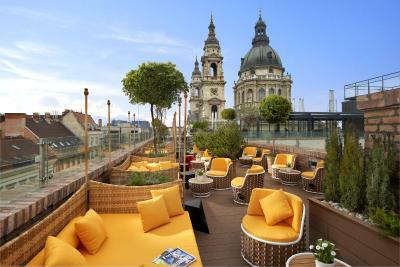 When would you like to stay at Aria Hotel Budapest by Library Hotel Collection? 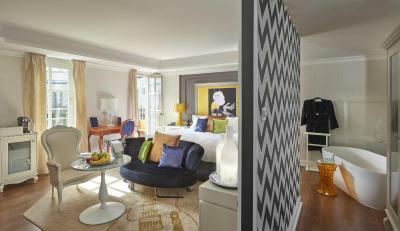 This room has a king-size bed, located in either the Jazz or the Contemporary wing. 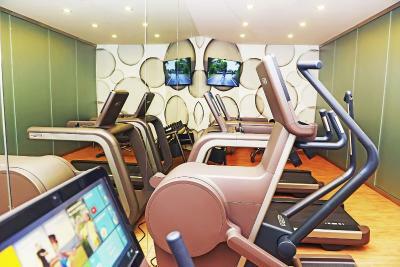 Each unit is furnished with a French writing table, a marble bistro table and a large flat-screen TV with a sound system, a DVD player and air conditioning. Most of the luxurious Onyx bathrooms offer a separate bath and a shower, as well as a bidet toilet and heated towel racks. 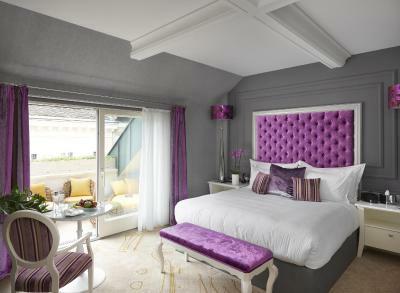 These rooms have access to a semi-private balcony overlooking the Music Garden. Both the room and the balcony are 100% nonsmoking. Please note that the hotel is strictly non-smoking. In case of violating this rule, charges may be applicable. 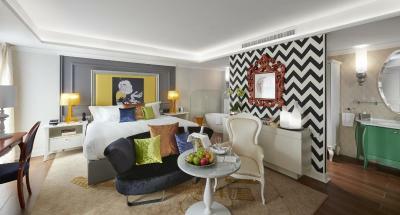 This room has a king-size bed, available in a variety of different musical genre decor styles. Each unit is furnished with a writing table, a marble bistro table, a small loveseat and a large flat-screen TV with a sound system, a DVD player and air conditioning. Most of the luxurious Onyx bathrooms offer a separate bath and a shower, as well as a bidet toilet and heated towel racks. Each room has a open air balcony overlooking the Music Garden Courtyard. Both the room and the balcony are 100% nonsmoking. 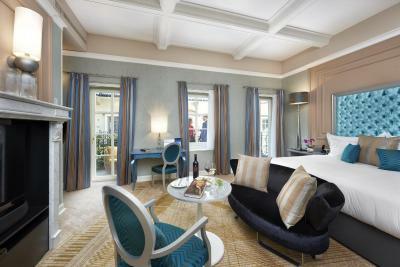 This room features one bedroom with a king-size bed and a separate parlor, located in the Opera wing of the hotel. The bedroom is furnished with a French writing table, a chez lounge, a marble bistro table and a large flat-screen TV with a sound system, a DVD player and air conditioning. The parlor offers a pull-sofa bed, a chez lounge and a small dining table. This room is equipped with a luxurious Onyx bathroom that features a heated towel rack, a bidet toilet, and a luxurious shower stall. These rooms have soundproof windows and offer views of the city. Smoking is not permitted in these rooms. 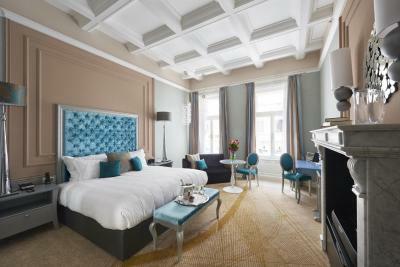 This room has a two double-size beds, located in the Classical wing. Each unit is furnished with a French writing table, a marble bistro table and a large flat-screen TV with a sound system, a DVD player and air conditioning. Most of the luxurious Onyx bathrooms offer a separate bath and a shower, as well as a bidet toilet and heated towel racks. These rooms have soundproof windows with city views and are 100% nonsmoking. 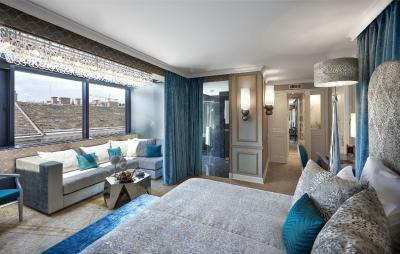 This room has a king-size bed and, located in either the Opera or Classical wing. Each unit is furnished with a French writing table, a marble bistro table and a large flat-screen TV with a sound system, a DVD player and air conditioning. 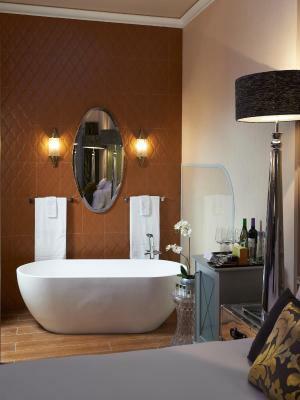 This room offers a luxurious Onyx bathroom with heated towel racks and a bidet toilet. Some rooms have a separate tub and shower while a few offer a luxury shower stall only. These rooms have soundproof windows and offer an outdoor terrace with city views. Smoking is not permitted in either the room or on the terrace. 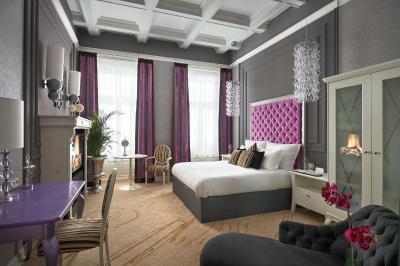 This room type has a king-size bed, located in the Classical wing. Each unit is furnished with a French writing table, a marble bistro table, a large flat-screen TV with a sound system, a DVD player, air conditioning, and also offers a full sized pull-out sofa bed. Many of the luxurious Onyx bathrooms offer a separate bath and a shower, as well as a bidet toilet and heated towel racks. These rooms have soundproof windows with city views and are 100% nonsmoking. 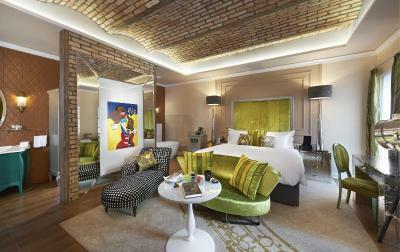 Aria Hotel Budapest is a music-inspired luxury boutique hotel celebrating the warm and passionate culture of Budapest. 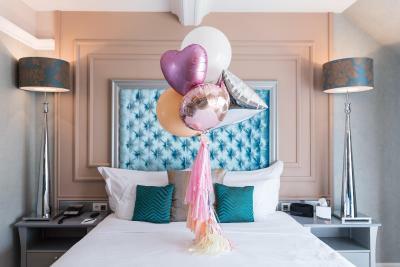 Each one of the four wings of the hotel is dedicated to a music genre: Classical, Opera, Contemporary and Jazz, while every room celebrates one of the world's greatest musical legends from Maria Callas to Elvis Presley. 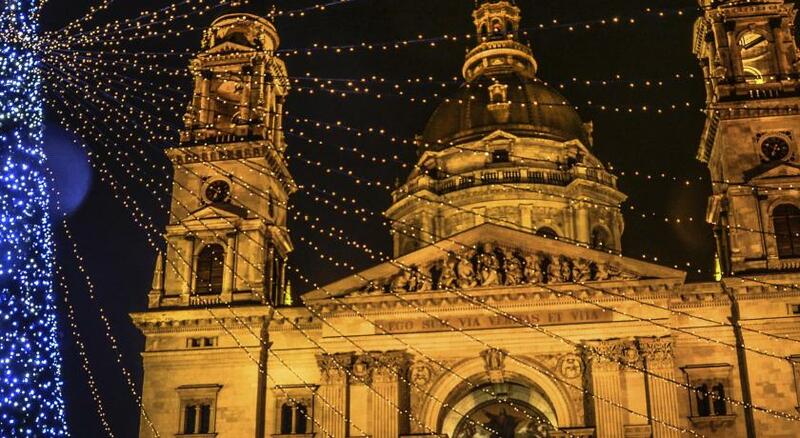 The hotel is located right next to the glorious St Stephen’s Basilica that can be best enjoyed from the building’s High Note SkyBar providing a 360° view of Budapest. Aria’s Harmony Spa has won Best European Wellness Spa at the World Boutique Hotel Awards and was a finalist at Gold Key Awards in three luxury categories. 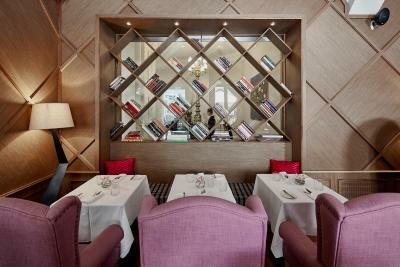 The hotel is a member of Library Hotel Collection voted best small luxury brand in the World. 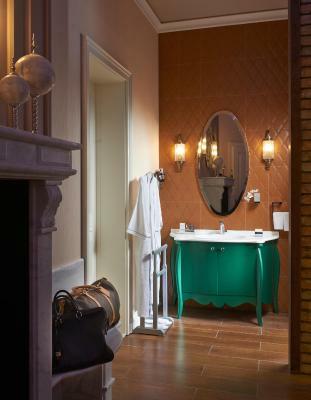 House Rules Aria Hotel Budapest by Library Hotel Collection takes special requests – add in the next step! 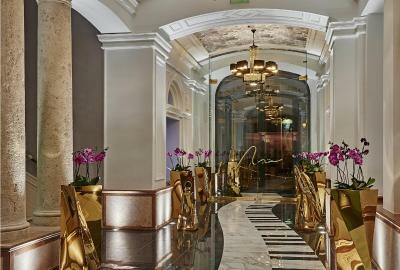 Aria Hotel Budapest by Library Hotel Collection accepts these cards and reserves the right to temporarily hold an amount prior to arrival. Please contact the property in advance in case of arriving with children. Contact information can be found on the booking confirmation. With prior approval most pets up to 8 kg (17.6 pounds) may be accommodated at the property. A VIP pet package is also available for an extra cost and includes pet bed, food & water, welcome treat and toy to keep. Please note that nonrefundable reservations should be fully prepaid through safe payment link which will be sent by the property after making your reservation. I thought a lot about how to describe this hotel and only one word all the time came to my head and she "wow" !!! The hotel is amazing !! 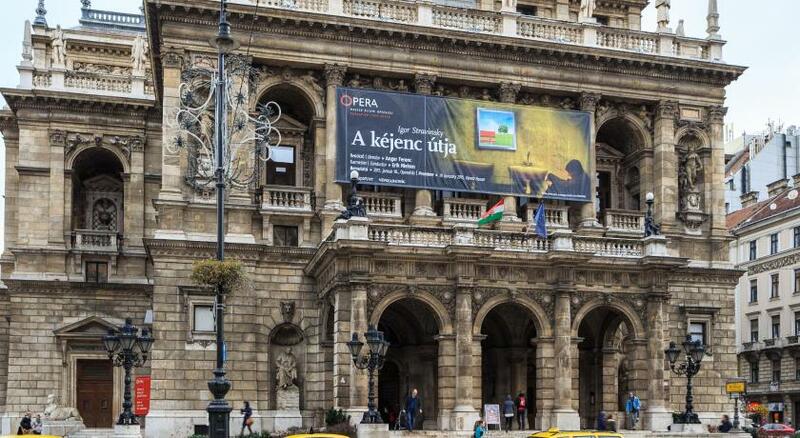 Located in the best location in Budapest !! The staff is perfect !! The hotel and the rooms are clean as high as I have seen (and I have seen loads) We are definitely going back to this hotel on our next visit to Budapest! Thanks to the wonderful hotel staff who did everything for our hours to be perfect! warmly recommended! Worth every penny !!! They’re renovating a bar and restaurant at the moment. It doesn’t really affect the hotel but will be even nicer when finished. Good reason to return! This is not a 5 star hotel based on interactions with staff. They really aren't trained well enough to solve problems as you would expect in a 5 star. This is a 4 star hotel. Staying in the wing that leads to rooms is the 10 and 11 series is not recommended. The elevator is always occupied by staff. The elevator is used to get food and services. It smells cooking all the time. It is a shame for a nice hotel to have that drawback. The bed was huge and comfortable, location of the hotel was perfect for us, breakfast was just right, the afternoon complimentary wine and cheese was a nice touch, the roof top wine bar is a must.